from the Teller & Michelson lunch lot in Irvine, CA. Today’s truck gathering included BOTG, Lime Truck, Dos Chinos, Rancho A Go Go, Burnt Truck, Lee’s Philly, Bakery Truck and Oh For Sweet’s Sake. Piaggio’s was unable to attend today due to a private event they were hosting. Last week,a mysterious bright pink truck pulled up to the lot just as I was leaving. Today, I discovered that it was a new (just a month-old!) truck called Ranchan Ramen. They took over the previous WYSS truck up in Los Angeles. 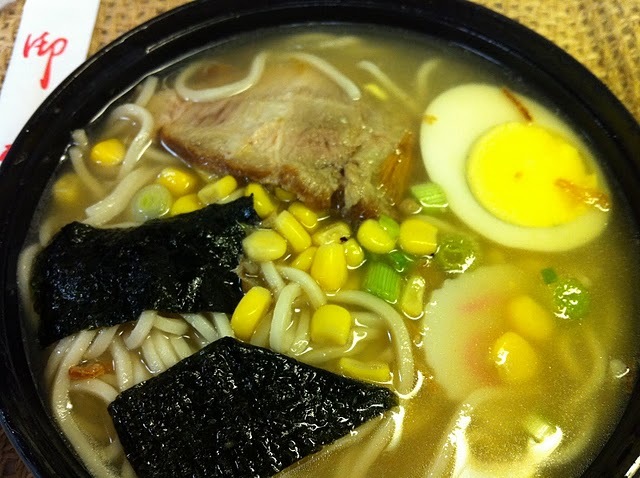 As their name suggests, the Ranchan Ramen truck serves different kinds of ramen with various toppings (corn, bamboo shoots, etc) you can add for an additional charge. 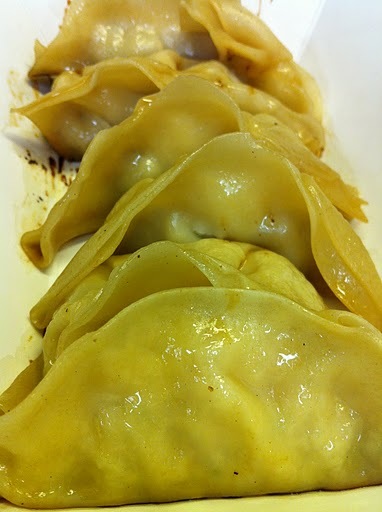 They also serve different types of skewers and other commonly recognized Japanese appetizers. I ordered the “Ranchan Special” ramen and a side of their gyoza. 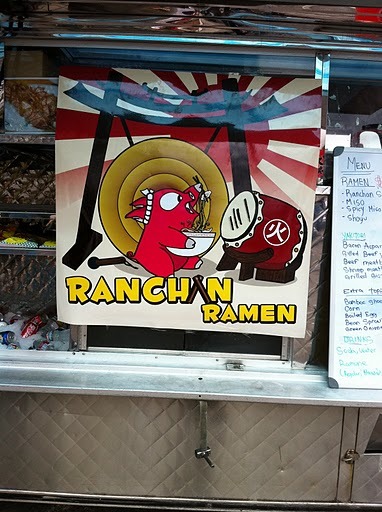 Ranchan Ramen is definitely experiencing common problems for a new truck. For starters, the very nice girl who took my order below wasn’t very familiar with the menu, and had to confirm with Eddie or Enrique when customers asked about their food. Then, there was a mix-up in the orders to where four of us waiting for our food had to wait a little longer before our orders were corrected. Eddie did apologize for the delay and I wasn’t in a rush to get back to the office, so it was not much of an inconvenience for me. I do wish them the best and hope they are able to work out the kinks as quickly as possible.